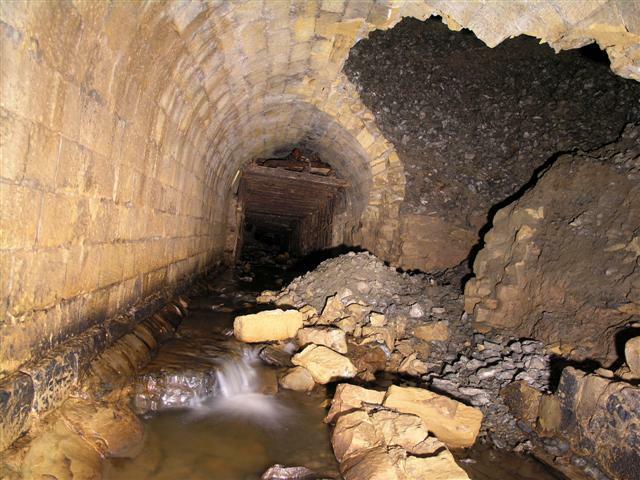 Report - It's a culvert. It's disturbing. It's Temptation. 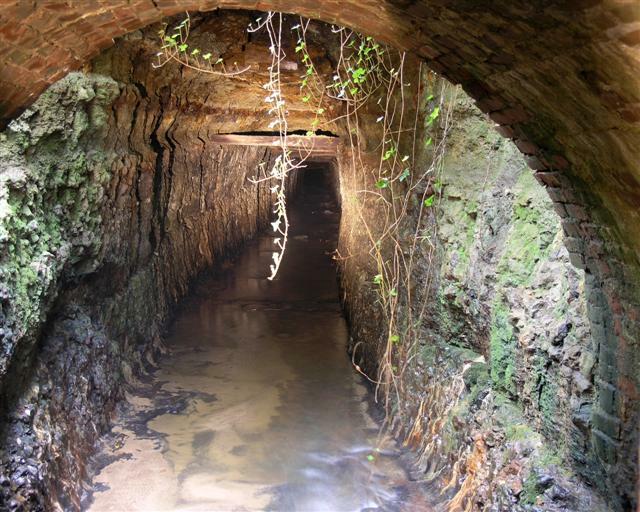 We wouldn't normally give a culverted stream a name, as, err, it already has a name. But in this case an exception is made. Temptation, because any explorer viewing the entrances would be hard to resist the temptation to enter. And we couldn't. 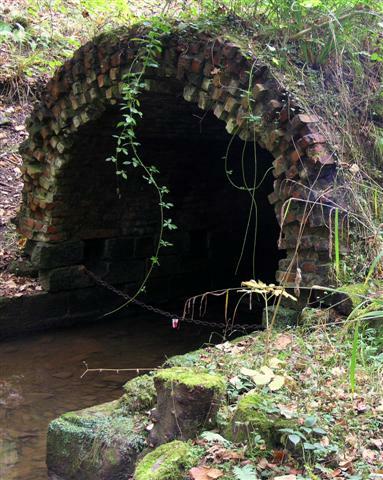 Here's the downstream entrance, a great shaggy dog of a vaulted barrel brick arch. The four layers of brick in the arch might seem like overkill, that's what you'd normally find in a 30ft diameter double-bore railway tunnel going under 300ft of hill. This is worse, it's going under several million tons of unstable mining waste. To be blunt, it's a culvert through a spoil heap. 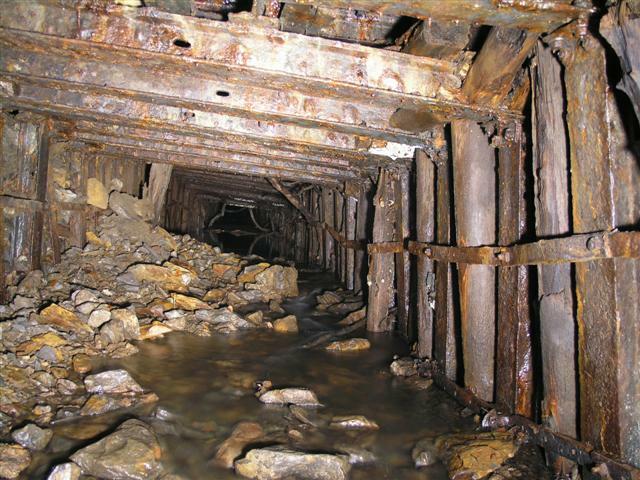 This old mine sits in a steep valley and obviously no-one would want to haul the spoil up and out of the valley. So it started to build up in the valley, until they had to build the culvert to stop the stream being dammed. And then of course all the spoil could be dumped on top of the culvert, with the stream happily running through the spoil heap. Inside is a nice stone arched tunnel. Every few feet along the walls are small recesses, possibly for miners' candles. For a short while everything looks OK, but then it becomes obvious that over the years running repairs have had to be made. Where the walls have fallen in repairs have been made with pit props, and by re-building the walls in brick. Then it all goes pear-shaped and there has been a major failure of the culvert wall and you can see into the spoil heap. The collapse goes up about 30ft and presumably most of the spoil that has fallen into the culvert has now been washed away. Rather disturbingly at this point we heard a distant rumble above the noise of the water. Just after this point the stone arch structure stops and is replaced by metal bracing, pit props and railway sleepers. 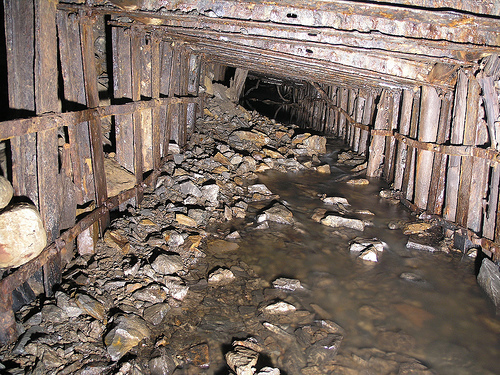 It looks as if the metal frame was made, braced with pit props, then sleepers placed over the outside of the frame to stop the spoil coming in. 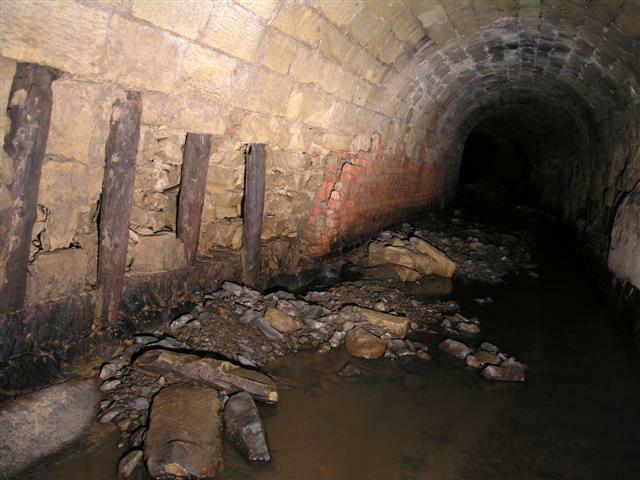 As the wood has rotted away over the years it seems as if the spoil is now being washed into the culvert. A couple of pics of this as it's as far as we got before I decided; I'm a coward, get me out of here! The weight of the spoil heap appears to be twisting the metal frame, pushing one side into the earth. The culvert gets lower and lower and it looks like the only way to continue would be on hands and knees through the water. From looking at the other end from the outside things would get better after this pinch point but that will have to wait for a return visit. 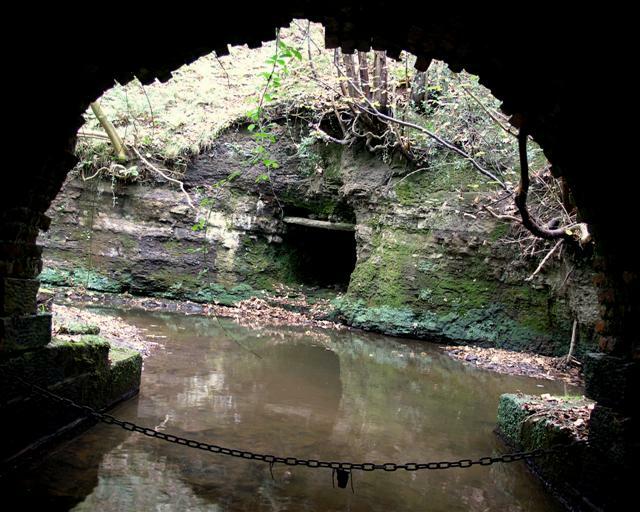 This is the view out of the downstream entrance, directly opposite what is probably a drainage adit from the mine. And I have to say a cup of tea never tasted so good as when we got out of here. Finally, the other reasons why this is called Temptation are here. 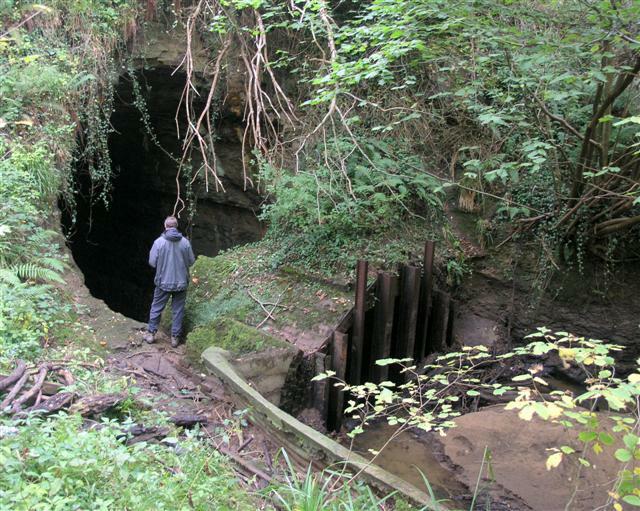 This is a view of the upstream entrance, with that mysterious man known only as "The Figure" added for scale. And a look into what lies beyond the pinch point. 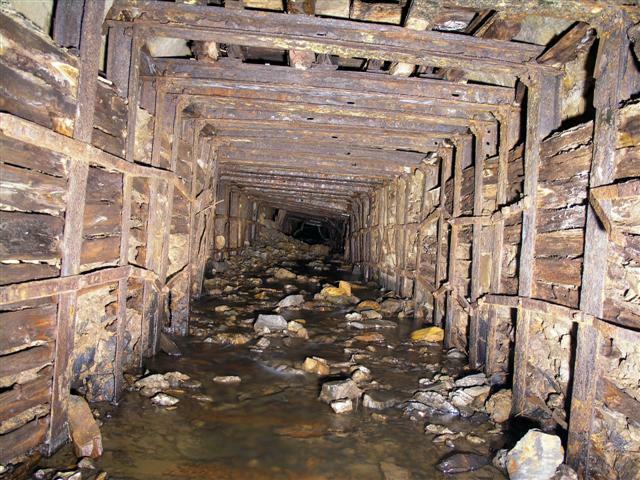 Here the channel has been cut through the rock by the miners. The drill holes are clearly visible in the walls. Temptation.